The Fluffy Movie is part stand-up, part psychotherapy. Directed by Manny Rodriguez and Jay Lavender. Gabriel Iglesias is hardly the first stand-up comic to talk openly in his act about traumatic experiences, but a bold aspect of his concert film The Fluffy Movie is that it frames his entire career in terms of personal pain. Fluffy opens with a skit depicting his conception (his mother, fleeing an abusive husband, has a brief fling with a mariachi singer) and early adolescence (in which he escapes his lonely childhood by watching the concert film Eddie Murphy Raw). Not long after he takes the stage at the SAP Center in San Jose, he goes into an extended bit about his life-threatening obesity and emergency gastric bypass surgery. The bit climaxes with Iglesias explaining that one reason he wants to stay alive is so he can continue making people laugh. Once again, comedy gives him a reason to keep going. This passage isn't as astonishing as the first section of Richard Pryor Live on the Sunset Strip (1982), in which the groundbreaking comic opens up about his drug addiction and the freebasing accident that nearly killed him. But Iglesias isn't anywhere near as confrontational as Pryor was. He's a crowd-pleaser reminiscent of Robin Williams, inserting funny sounds and vocal impersonations into nearly every line and alternating raunchy material with moments of unabashed sentimentality. In the second half of Fluffy, Iglesias shares good-natured anecdotes about being stepfather to a tight-lipped teenager before culminating with an account of meeting his biological father 30 years after the man abandoned him. In terms of narrative structure, the film suggests a constructive psychotherapy session, as Iglesias identifies the roots of his self-destructive behavior, learns to appreciate himself, and starts to work through his problems. However mawkish the results might be, this structure makes for a better-than-average concert film; even if you don't find it funny, you can still enjoy it from the vantage point of an amateur psychotherapist, finding clues to his unconscious behavior. Iglesias admits that his obesity is caused by an addiction to fast food, though he doesn't go so far as to identify this as a coping mechanism, an effort to insulate himself from pain. Likewise, the opening skit suggests that feelings of abandonment may motivate his compulsive crowd-pleasing, though he never acknowledges this either. 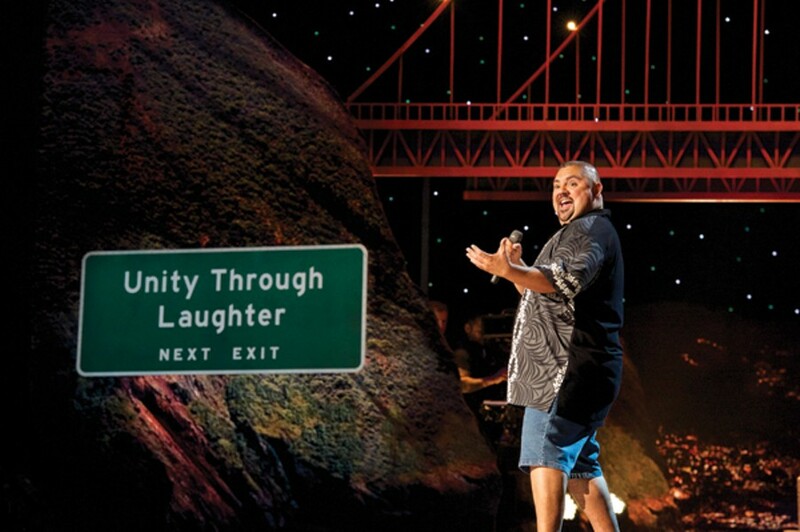 A giant sign onstage reads UNITY THROUGH LAUGHTER, and though Iglesias often jokes about gay men and racial minorities, he does so in a warm, inclusive way. Watching all this, I wondered if he got involved with a single mother out of this same need to please people. That's another place this ingratiatingly open comic won't go, though his skill as a storyteller enables viewers to go there on their own.